A Stag night istraditionally the Groom’s last night of freedom can be a wild night. Whether it’s a quiet drink, a wild party, ending up tied to a lamp post or on a train to the far reaches of the country are all possibilities on stag nights. But equally all occasions when the group of guys want to show the team spirit and show their unity with the groom and wear fancy dress. Whether it’s Tshirts or something more bizarre, it all adds to the fun of stag nights. 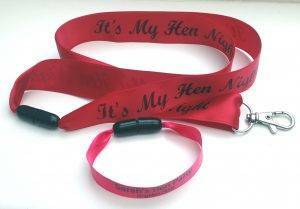 The simplest addition to the day’s event is to wear a badge which we can supply and which can contain whatever message is required. The design can be as simple or complex as is required. 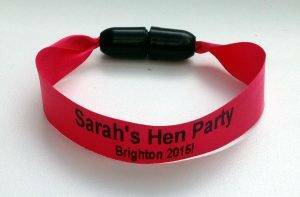 It can be colour co-ordinated to fit in with any club colours or favourite team colours. It is also the perfect vehicle for embarrassing the groom with a photograph from his childhbood. 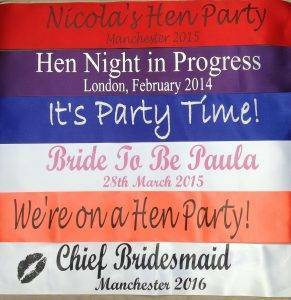 We have a range of different styles and designs of badges that you can choose for your stag night. 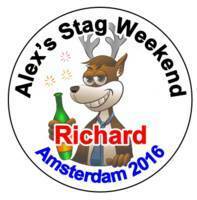 Add the name of the stag. And then if you wish you can also put the individual names or nicknames of the other guys on the stag night on the badges. If you want to get a special badge for the groom then the simplest way is to convert it into a rosette. 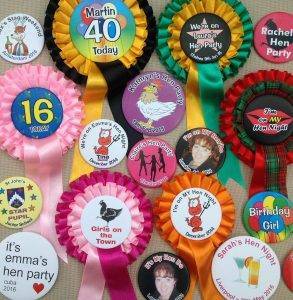 We can produce a rosette in your choice of design. 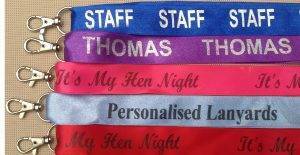 We can also supply the ribbon colours and tail colours to your requirement. The centre of the rosette then has the same design as the badge that the others are wearing. Of course it doesn’t have to be the same design. 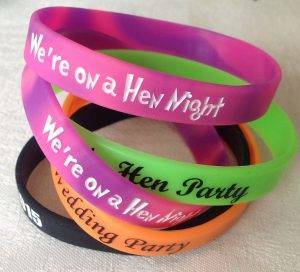 You could choose a different one for the stag and also modify the wording as well.